Five names for the new university that mine will morph into have gotten enough suggestions to warrant serious consideration from the University of Texas system. Here’s my take on them. The acronym kills this idea. “UTI” already has an unpleasant meaning: “urinary tract infection.” Eeeewwwww. No, no, no, no. Even if you go “UTIN,” it makes you think of a cheap, malleable metal that you can food in. How did this suggestion make it onto a list of suggested names? Not enough people with any sort of biological background, and probably not many women. 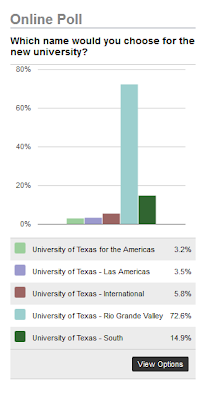 “University of Texas International” also has problems shared by our next two candidates. “...of the Americas” was featured in the background of the original announcement for the formation of the new university. I suspect that there is someone in the University of Texas System, maybe the chancellor, who is very fond of this idea and just won’t let it go. “Las Americas” is the same idea, just running further with the notion that we are somehow going to be a bilingual university. All three of these suffer from the same problem: it is disconnected from the community that the university serves. The University of Texas System wants the new university to be big and ambitious. Hence, we have three names that try to suggest that this is an international institution. 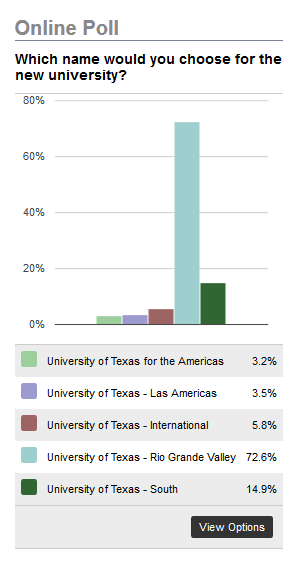 But 93% of the students enrolled at UTPA come from the four counties of the Rio Grande Valley (page 11 here). That’s where our students come from. I suspect the stats for University of Texas Brownsville are similar, and that this will probably also be true of the new university. We’re not an international university. We’re not even a state university. We’re a regional university. That is not going to shift anytime soon, grandiose plans notwithstanding. People who hear “University of Texas South” will think of the wrong place. I guarantee you that. To make matters worse, like the three names above, it doesn’t connect with the community. People here don’t refer to this region as “South Texas.” This is what people from outside the region call it. To make matters still worse, this name would be confused with South Texas College, a completely separate institution. Several people have suggested “The University of Southern Texas.” This sounds smoother, but the University of Texas System won’t allow it. The name has to begin with “University of Texas.”And people would still confuse it with South Texas College. A poll on a local newspaper site suggests this name is the most popular among residents by a long, long ways. I hope that the the UT System will catch up with what I’ve said all along! Meanwhile, in other good news, $196 million has been approved for infrastructure on the new university. This including $70 for a science building. That’s great, because we are full here.